The annual Marietta Art in the Park festival returns to Glover Park in Marietta Square from September 1-3, 2018, from 10am to 5pm each day. 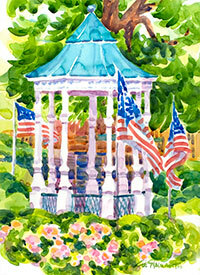 The annual art festival takes place in Marietta Square each Labor Day weekend and features a juried exhibition pieces by over 175 artists from all over the country as well as local artists from the Marietta area. All items are handmade original work including paintings, photography, jewelry, sculptures, woodworking, pottery, and more. For more information, visit www.ArtParkMarietta.com.